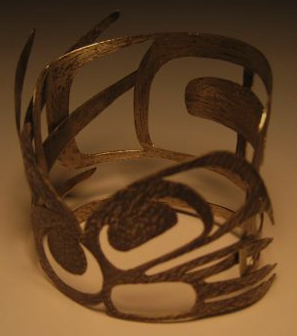 My revived interest in Northwest Coast art dates to nearly two years ago, when I commissioned a copper bracelet from Henry Green. So, naturally, I’ve kept an ongoing interest in what Green was doing – an interest that has been further reinforced by mutual acquaintances and by meeting Green when I was in Terrace for the Freda Diesing School graduation show last April. But, until this last week, I hadn’t bought anything else by Green. The lack of purchases was definitely not a lack of interest. Although I didn’t realize the fact when I commissioned the bracelet, Green is one of the two leading Tsimshian artists working today (the other is Robert A. Boxley), and probably the premier jeweler. His engraving is exceptionally fine, and his invention is high, although it rarely strays far from tradition. Moreover, his jewelry is exceptionally well-priced, perhaps because he doesn’t want to set too high a pricing standard for other artists, or perhaps because his income comes largely from poles and large commissions. He could easily get two or three times what he charges, which makes a silver pendant from him one of the best buys you can find in Northwest Coast art. The only real reason for not buying another of his pieces until now was simply that the artists whose work I want to buy far outstrip my income, especially in this last year of recession. Several months ago at Alano Edzerza’s Gift of the Raven opening, I had seen and appreciated casts of combined pendants and broaches by Green representing some of the Tsimshian house crests. As is inescapable with casts, the pendants suffered from an obvious loss of detail, but I appreciated them all the same. When Morgan Green, Henry’s daughter, sold some to help finance her way through art school (presumably with permission, although I keep have visions of her sneaking into the family workshop at night), we bought a cast of the mosquito pendant from her. But the cast we really wanted was the devilfish. Consequently, when I stumbled across the engraved original at Coastal People’s, I bought it as soon as I could afford it. What first struck me about the pendant is its irregular shape. 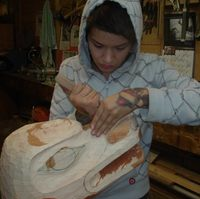 Distorting the design to fit its surface is common in Northwest Coast art, but, in this case (and several of the pendants from the same set), Green has chosen to distort the surface to fit the design. Rather than squeezing the devilfish into an oval or some other pendant shape, he decided instead to let the pendant take the shape of the devilfish instead. At the same time, within the shape, Green has distorted the shape even though the shape does not require him to. 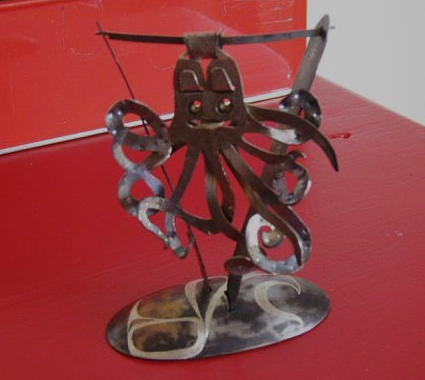 I have seen a number of Northwest Coast designs for a squid or octopus, and almost always they are depicted in a flat, semi-realistic style. However, Green’s tangle of body and tentacles (which are reduced to three, just enough to give a suggestion), although more abstract, captures more of the feel of a devilfish’s irregular movements than a realistic portrayal. Since the irregular movement is probably what most people see first when they encounter a live octopus or squid (even in a tide pool), the paradox is that Green’s abstraction is emotionally truer than a literal design. Moreover, because the irregular movements are apt to create uneasiness and fear, by capturing the movements, Green’s pendant suggests why a devilfish might become a household crest. With its outsized, eagle-like beak, Green’s devilfish seems a savage predator, powerful and potentially dangerous. The large areas of cross-hatching and the parallel lines of dots or brief lines are straight from the traditional Tsimshian repertoire. However, in this pendant, Green adapts these elements for practical purposes, using an unusual filling around the eye to give it an unearthly look and turning the parallel lines into suckers on the tentacles. At the same time, the placement of the tentacles seems to owe more to Celtic knotwork than traditional Tsimshian work. And, in fact, according to Morgan Green, this resemblance is deliberate, reflecting the fact that his first wife was Scottish, and his children are half-Scottish. However, while Don Yeoman and others have tried to combine Northwest Coast and Scottish design in the same piece, this pendant is one of the few that does so successfully. 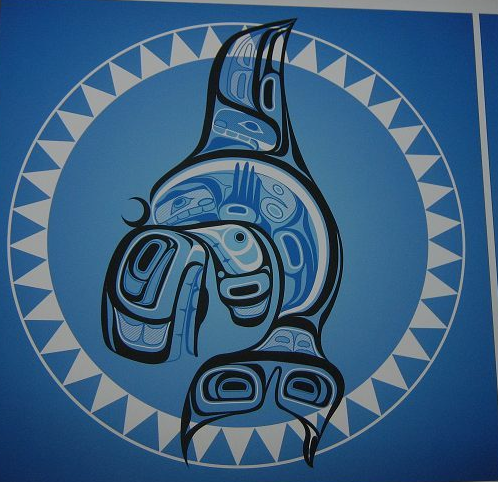 It does so, I think, by balancing the knotwork with the Tsimshian parallel lines and cross-hatched background, blending the two traditions so they work together. This blending is worth noticing because I think it points to how Green can innovate within his main tradition. Unlike a beginning artist, Green is not restrained by the tradition, forced to alter his design to fit the tradition and therefore chafing at its limitations. Instead, Green is so utterly familiar with the tradition that he can use its elements for his own purposes. In this pendant, the result of his knowledge is a miniature masterpiece in silver.